Greta now has a forever home! Meet Greta. She is a lovely 10 month old puppy, very sweet and affectionate. Pretty too as you can clearly see. 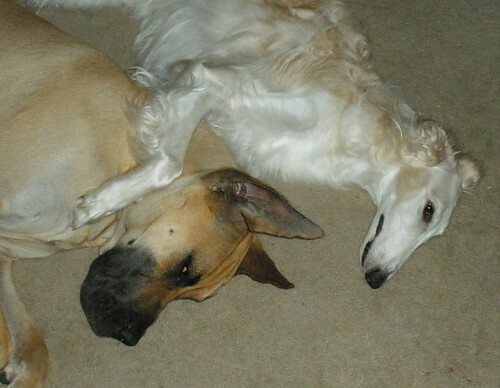 Greta has always been a kennel dog but we will work on her house manners while she is in foster care. She is still a puppy. She has never been around children or cats but is good with other dogs. 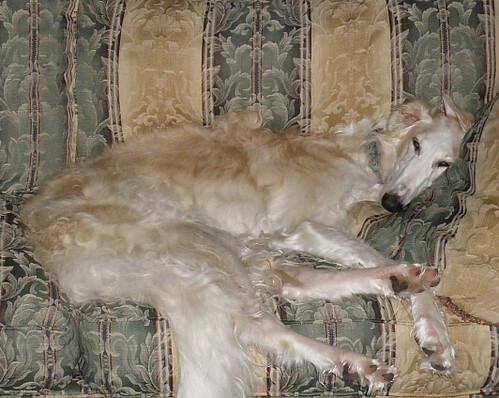 Greta would do well in a home with the patience to deal with a puppy and Borzoi experience. She is willing and eager to please. Mischa passed with honors! she also is no longer using her crate to sleep in or retreat to...and yesterday morning we found she and Suki (one of our cats) curled up sleeping together on her bed, Kenji across the room on his bed sleeping. Not quick enough for a pic but it was a very tender moment.